VD = The voltage drop of the circuit, in volts. R = The resistance of the conductor. L = Length of the circuit from power supply to load. 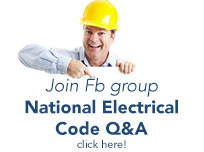 • The National Electric Code recommends a maximum 3% voltage drop for branch circuits. Voltage drop can be decreased by increasing the wire gauge, decreasing the load current, or decreasing the length between the power supply and the load. • As a reference, a one circular mil, one foot long conductor has a resistance of 12.9 Ohms (copper) or 21.2 (aluminum) at an operating temperature of 75 C). • For conduit size calculations, check out the conduit fill calculator here.